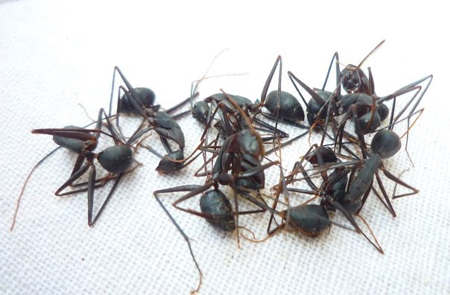 I’m sure I remember taking pictures of this, but now can’t find them anywhere… To be fair it just looks like normal curry, with ants in – mix of types though, few big ones and lots of little ones. Eating ants isn’t unique to Cambodia – you get can them fried or even chocolate coated as a snack everywhere from Brazil to Africa. But what I particularly liked about this Cambodian dish was that they hadn’t just gone for the easy option of one type of ant – no. This meal was made with two (or possibly even three) varieties. The dish itself was like a curry of beef with what appeared to be a generous sprinkling of large leaf-cutter ants – them of the large orange thoraxes, and crunchy deep-fried flavour. But on closer inspection the bulk of the dish comprised many thousands of teeny tiny ants which formed the mainstay of meaty texture. Sadly I didn’t like this particular dish very much, but funnily enough I don’t think it was the ants. There was some other flavours (I think tamarind was heavily involved) which gave it a very strange sour kind of taste, although when I ate the ants separately they tasted quite good. You can find curried ants at a restaurant on Street 182, about three blocks west from the Royal Palace. The name is in Cambodian, but you can find it by the roasting pig on a spit outside, and grand colourful entrance of fairy lights leading to an interior of miniature bridges over little waterways. Menu is in English with pictures, curried ants around $3.